Sixty children from Hudson’s Destination Imagination program and their parents contributed more than 1,000 hours to this project, working with artist Lynn Jermal. From I-94: Take WI Exit 1 north, turn west at first light on Buckeye Street. Go one block to First Street, turn south. Bench is at Picnic Point, between playground and boat launch. The raw material for the Hudson Art Bench was ideas. 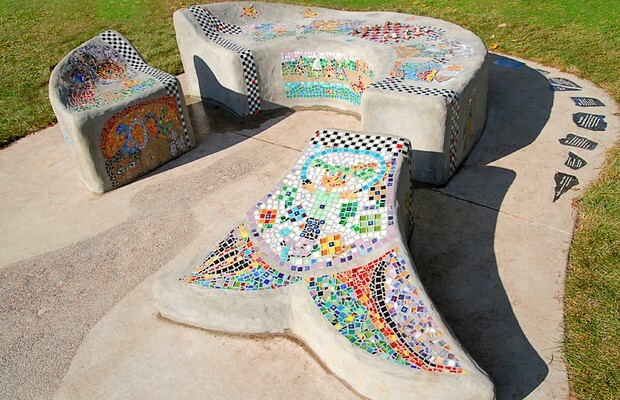 The bench was sculpted from the imaginations of 60 adults and kids, and what sits on the riverfront today contains something of everyone. What sits there is a fish, arcing as if swimming or leaping. Its scales are mosaic – graphics of glass and tile – depicting memory and history, nature and people. And a checkerboard. The mother, artist, wife and professor who led 60 Hudson citizens to new lifelong memories of creative cooperation and a sense of place passed away in 2012, at the age of fifty-nine. The bench is home to many memories of Jemal, and is a monument to her trusting, positive spirit. “Shut your eyes and keep smiling and let things happen on its own, that’s her legacy,” Selon says. 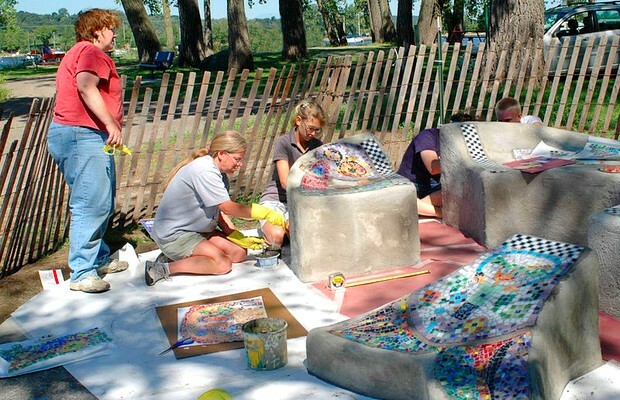 This process produced a bench that portrays the town and the participants’ sense of place, and also instills a strong feeling of pride. 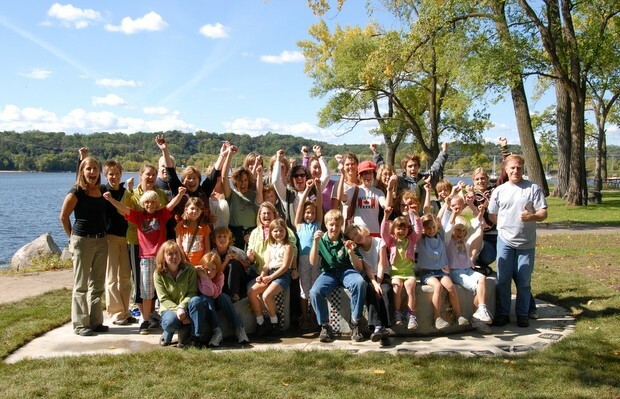 Young kids, teens, and adults learned how they could work together, no matter their age. 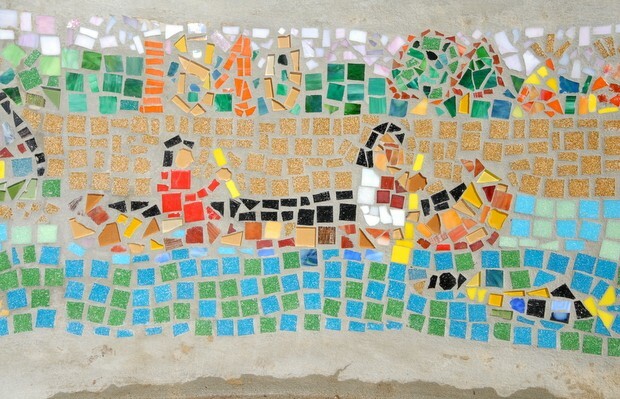 The kids could contribute in many ways: some helped with design, others with building the cement structure, and still others with the mosaics that adorn it. The images that are depicted on the bench in mosaic were picked out by the kids, and are a way for them to add their voice to the long history of the city and the river valley, Jermal’s son recalls. “My mom taught about mosaics, and provided some historical research about the river valley, and then had kids pick out their favorite stories and images from history, or add to it, anything that was part of their history as the current occupants of Hudson and the river valley,” Selon says. After Malaphany and Anastasia Shartin from The Phipps organized a walking history tour of Hudson for the participants, Jermal got involved in historical research. The artist was drawn into researching Hudson’s history, says Malaphany, and spent a lot of time in the history room at the city’s library. In Hudson, what’s special includes its history, its river, a community full of ideas, and the legacy of artist, teacher, and mom Lynn Jermal. Play a game of checkers with your friend or family member! Search the park to find shells, rocks, or other items to use as checker pieces, and remember to put them back where you found them when you are done with your game! 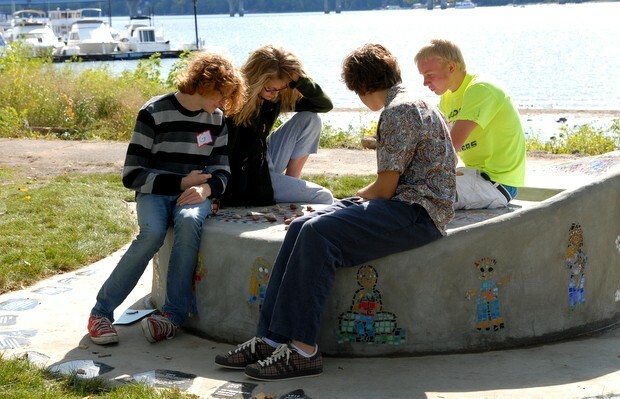 The River Bench was created by over 60 Hudson children and parents who contributed more than 1,000 hours and an immeasurable amount of creativity in collaboration with local artist Lynn Jermal in partnership with The Phipps Center for the Arts, Hudson Destination Imagination, and St. Croix Valley Community Foundation. With financial support from Hugh J. Andersen Foundation, City of Hudson Park Board, Hudson Community Fund, Hudson Daybreak Rotary, Hudson Education Foundation, Teresa and Kyle Jackson, Nuclear Management Company, St. Croix Valley Foundation, and Xcel Energy. And with in-kind support from Access Business Solutions, Dabruzzi Concrete, Don Hammer, Gary Peterson, Menard’s of Hudson, St. Croix County Historical Society, and University of Wisconsin - River Falls Art Education Program.